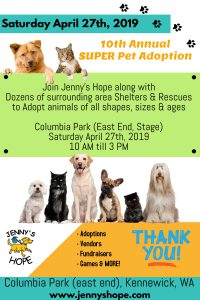 Come join Pet Overpopulation Prevention at the Jenny’s Hope Super Pet Adoption Event! “Our Super Pet Adoption gives shelters a way to come together for the same cause; helping animals find their forever home. It gives these animals a chance to shine away from a shelter in a fun and exciting environment and gives families an opportunity to see how wonderful all of these animals really are. Why is this event important? Shelters work out of kennels, dogs and cats can be scared and timid inside a row of kennels as they are confused as to why they are there. Rescues work from their homes through fosters and are not always immediately available to meet with. This event allows shelters and rescues to bring these animals to a neutral ground where you will see them come out of their shell. They get an entire day to play in the park, be shown lots of affection and hopefully find their forever home (this is important enough). No matter how big or small the shelter and rescue is this also gives them an opportunity to let our community know what they are all about and continuing to educate! How they’re striving to help our community in finding the orphaned pets a chance at a new life! Not only will you find local shelters and rescues we also invite different vendors to attend adding diversity and knowledge.